And then there's the screen. Oh, that lovely new iPad Air 2 screen. The iPad mini 3's screen is certainly sharp, bright, and beautiful, but it has a visible air gap. The iPad Air's display puts pixels right up against my fingers as I loft it effortlessly in the air. 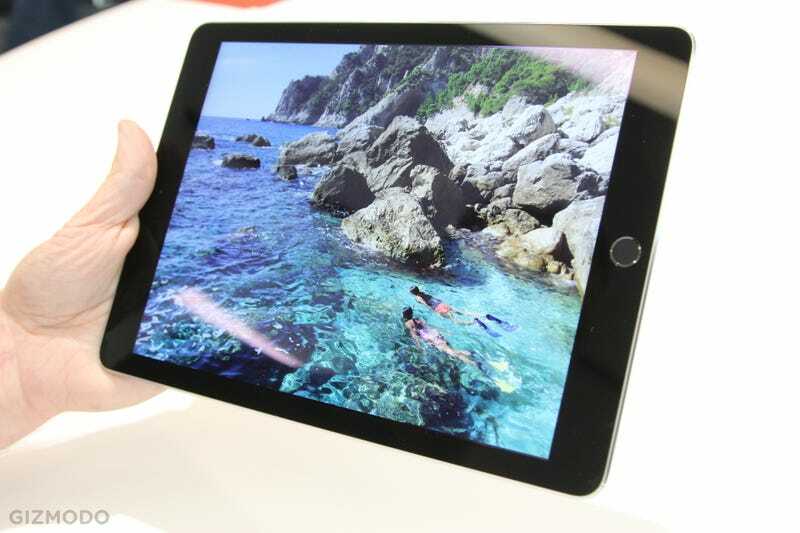 In fact, the screen's delightful enough that after looking at some of Apple's sample pictures on it, the new iPad's 8MP camera seems a little disappointing... at least in a completely white room filled with people crowding around the new gadgets! The viewfinder locked onto people's faces mighty quickly, but I'm not sure I'd take to shooting with this tablet quite as much as I did with the iPhone 6 Plus. I immediately missed the 6 Plus's optical image stabilization as I moved the tablet around, and I could instantly tell the 120fps slow motion doesn't hold a candle to the 240fps — that's twice as slow, slow enough to film an amateur shampoo commercial with wavy hair — as Apple's latest smartphone. So yeah, I don't know why I'd ever want an iPad Mini 3 when I can get an iPad Air or a iPhone 6 Plus. Both are thinner, lighter, more comfortable, and if you really want something smaller that isn't a phone, you can go back to the iPad Mini 2. The only major bummer with the iPad Air 2, meanwhile, is that it doesn't have NFC for Apple Pay at cash registers. The Touch ID sensor is there, but you can only use it to sign into apps and for online transactions. (The iPad Mini 3 doesn't have it either.) If you want payments on the go, you'll still need an iPhone. I'm an Android devotee when it comes to smartphones, and was hoping to get in on the Apple Pay by upgrading my iPad. Oh well. There's also no rotation lock / mute switch anymore, which is really kind of a bummer. I use it *all* the time on my third-gen iPad.